WOW!! 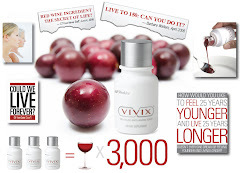 The testimonials just keep rolling in on Vivix, Shaklee's anti-aging resveratrol product. This really touched our hearts as Ed's wonderful mom had this and it was so sad to see how she no longer recognized her own son and how I became the maid who brought her lunch, etc.... She lived with us for quite awhile........ We can't go back and give her Vivix but I can certainly carry out the message in her memory. DISCLAIMER: This testimonial herein does not represent Shaklee's position on their products. It comes entirely from the experiences of a satisfied consumer..
Below is an update from Mary Hannon. Many of you know Mary and Maureen, whose Mom has Alzheimer's and has been living with Mary & Jeff for the last 10 years as she requires 24/7 care. On a side note, Mary hasn�t been able to spend much time on her Shaklee business for the past 3 years because she's been caring for her Mom, yet their Shaklee checks (with a comma in them) has been coming every single month because of the work she put into her business when she first started. I love this company. For the first time in a few years, my mom made a sandwich for herself!!!! We are really starting to think that Vivix is making a difference. Her appetite is definitely improved and she referred to me as her daughter to someone the other day! We're actually thinking of discontinuing her Aricept completely. Seems like it may be doing more harm than good? What a surprise! We started her on it as soon as it was available to the public. When it went on backorder we all got off it for a month or so, maybe even 8 weeks. I'd say in total she's been on it for 3-4 months maybe a bit less. Last week Maur showed Mom her wedding photo and Mom said: "That's me!" Maur then said: "Who's that next to you?" Mom said: "That's my husband!" Today I showed her another photo from her wedding (a group photo) and she did not recognize my father but she did recognize her father. I think I'm going to give her 2 teaspoons per day and see what happens!